Home / غير مصنف / Snow warning MAPPED: Europe hit by snow AVALANCHE - where is it snowing RIGHT NOW? 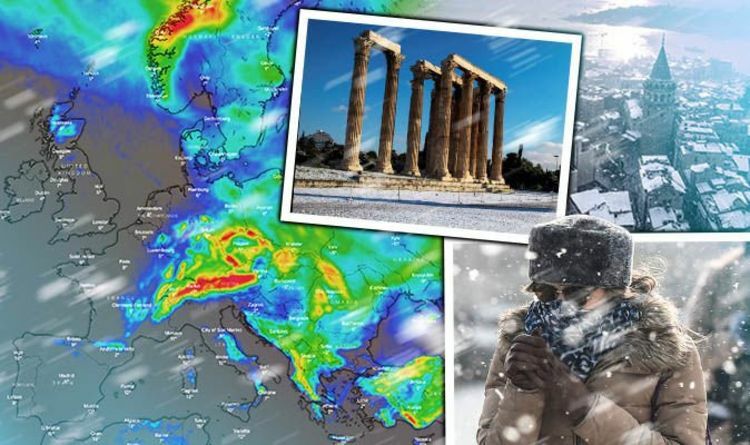 Snow warning MAPPED: Europe hit by snow AVALANCHE - where is it snowing RIGHT NOW? The deadly weather started by a storm coming from the North Atlantic into Scandinavia and northern Europe New Year’s Day. The system, named Storm Zeetje, then made tracks to eastern Europe and brought moist cold air into areas such as the Alps. Ski resorts in the Austrian Alps reported up to seven feet of snow in the first days of January, which lead to many resorts closing over safety concerns. Where is it snowing right now in Europe? Austria is being hit hard by the snow at the moment, with temperatures in areas such as Innsbruck and Liezen at bitter lows of -2C. Altdorf in Switzerland also has a blanket of snow due to -2C temperatures. Romania is even colder, with temperatures of -7 in Reghin and -9C in Brasov. Turkey is also experience snow fall and minus temperatures, along with Georgia. Kharkiv in Ukraine is freezing at -10C, while the Czech Republic also has snow falling. However, temperatures seem to be a bit warmer in Brno and Prague at 5C. Eastern and southern regions of Germany including Nuremberg and Dresden have snow and temperatures of 4C. The snow has left a devastating impact, as seven people have been confirmed dead over the past week. A 28-year-old man and a 23-year-old woman who went missing while snowshoeing were found dead near Salzburg in central Austria, according to the Austrian news agency APA. About 40 rescuers with dogs were still searching for two others who went missing while snowshoeing near Hohenberg in Lower Austria. In Germany, a 44-year-old man died in Wackersberg in Bavaria when he was hit by tree branches brought down by heavy snow, police confirmed. A woman who was buried by an avalanche last week in Uri, Switzerland, died due to her injuries on Saturday. Three skiers in Austria were also killed by avalanches at the weekend and one woman in Bavaria died in a weather-related incident. Police in Norway revealed four skiers, including a 29-year Swedish woman and three Finns, aged 29, 32 and 36, are presumed dead following a 300-yard-wide avalanche. This was reported last Wednesday in Tamok valley, near the northern city of Tromsoe. The UK has not experienced any snow fall so far this winter. But Coral has odds of 1/2 that snow will fall in London in January. Coral’s Harry Aitkenhead said: “Forecasters are warning that temperatures are going to plunge towards zero and beyond and it’s left us with no choice but to have the coldest winter on record as odds on.